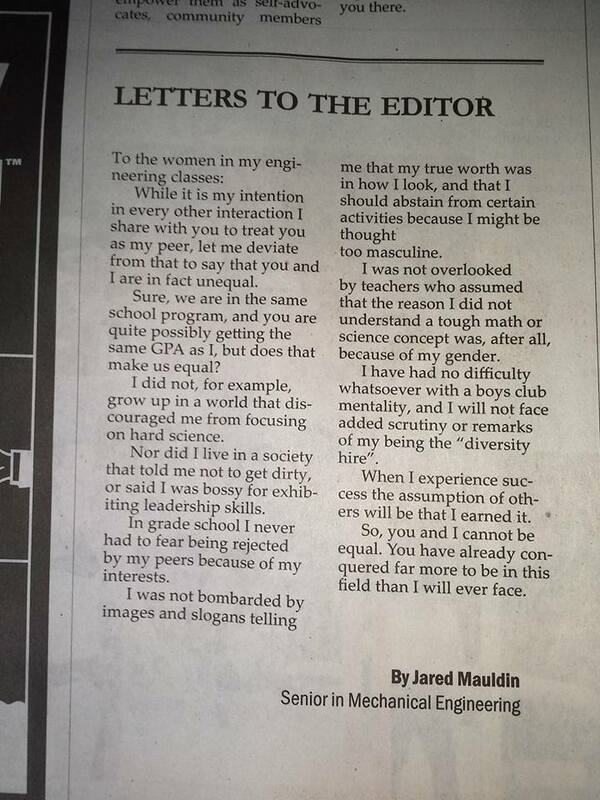 Jared Mauldin recently wrote a letter to the editor for his school paper. It garnered national attention and helped spot light women in engineering, which is awesome! However, the language in this letter threw me off. I have a lot of questions about his article. Was it his intention to say that this is a problem specifically at his school, or a problem within engineering in general, or was this article directed at society? Without knowing Mauldin wrote an article about privilege. Being a white middle class male, I’m not surprised that he missed that he wasn’t commenting on the inequalities in the classroom but something much more profound— as a white middle class male Mauldin does not face social adversity. This blog is obviously about engineering and I thought it was appropriate to comment or really counter comment on his views of females in engineering. I would like to point out that women in engineering do not need anyone apologizing to them for an unfair playing field. Actions speak much louder than words, if he had seen inequality in class room he should have taken the time to listen to the women with the right answers being discredited. He is perpetuating this “boys club” mentality. I poked around Mauldin’s facebook page and found responses to interview questions he had been asked. 4. What do you think is the bigger impact of discouraging women from pursuing STEM fields? I hate “teamwork”, but love collaborations. Often I have found in teams that a few driving members will carry a team along. With individual collaboration though, everyone contributes, everyone tries to put out their best ideas and in the end a project can have the best solutions possible. What happens when we start pushing some of these thinkers to the side? When they opt for other paths not because this isn’t a calling, but because they see the challenges as outweighing the rewards? I want companies to have access the best thinkers and the best ideas available and if we push certain people out of this field for reasons that have nothing to do with ability, we can’t have that result. Instead we have people who are doing work they find less satisfying, and companies who don’t have access to some amazing talent. He writes as though all females have been marginalized, which is not the case. What may have been a well intentioned apology ended up implying that society thinks that I am too masculine for pursuing a field that I am interested in. Jake Mauldin we are in fact equals, we are both senior mechanical engineers about to enter the work force after coming out of an academically rigorous major. Thank you for acknowledging that female engineers are unique in ignoring societal norms to get where they are, but they are your equals.